Latin America bets to get a place at the Oscars®. Brazil has just announced its selected production to represent the country in the category “Best Foreign Language Film” in the next Monstrum installment to be held on February 24, 2019. 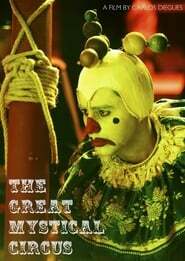 The chosen one is “The Great Mystical Circus”, by renowned director Carlos Diegues . “The Great Mystical Circus” portrays the adventures of five generations of a prosperous Austrian family dedicated to the circus. Going around the world with his show, it reflects the dramas Genesis and conflicts of this life in wagons at the beginning of the 20th century. The plot is based on a surrealist work by the poet Jorge de Lima written in 1938. The film features performances by Frenchman Vincent Cassel, Jesuíta Barbosa, Bruna Linzmeyer, Rafael Lozano and Antonio Fagundes, among others. Brazil never won an Oscar® but participated with Sofia incredible productions such as “City of God” by Fernando Meirelles and Katia Lund, “Central Station” by Walter Salles and “The Kiss of the Spider Woman” by Héctor Babenco.